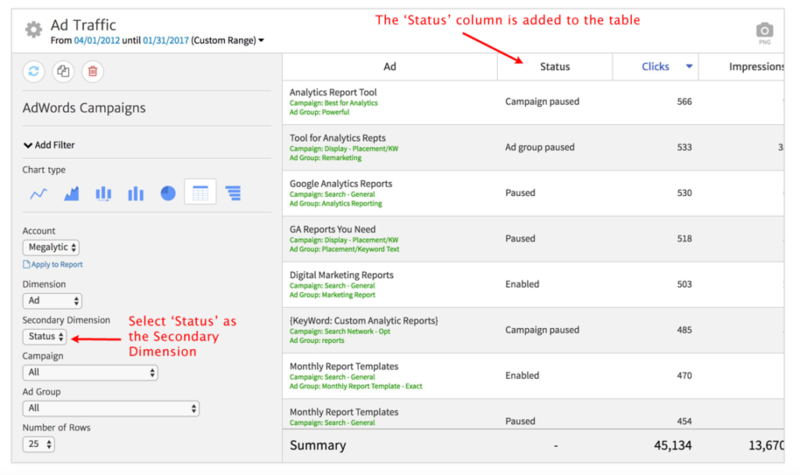 AdWords Widgets support a ‘Status’ column that reports the status of a Campaign, AdGroup, Ad, Keyword, Placement, etc. You can also filter on ‘Status’, but the filtering works a little differently than the display values. This article explains how the column and the filters work together. To display the Status in a table, open the widget editor, and select ‘Status’ from the Secondary Dimension selector. This will cause a ‘Status’ column to be added to the table. In the above example, we are showing the status of Ads. If an Ad is running, the Status will show up as ‘Enabled’. If not, then the Status column indicates why it is not running. ‘Paused’ means that the Ad is paused. But, if the Ad group is paused, it will say ‘Ad group paused’, and if the Campaign is paused, it says ‘Campaign paused’. It works similarly for ‘Removed’. 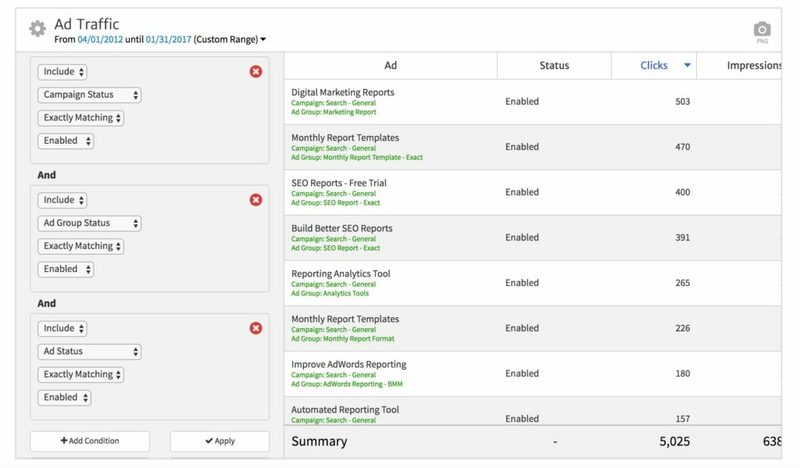 You can filter on the status of each dimension: Campaign, Ad group, Ad, and Keyword. In the filters, there are three possible values for each dimension status: ‘Enabled’, ‘Paused’, or ‘Removed’. So, for example, if you want to see only the Ads that are running, you need to filter on Campaign status == ‘Enabled’, Ad group status == ‘Enabled’, and Ad status == ‘Enabled’. (For more information on filtering, see: Filters). Below is an example of an AdWords Campaigns widget with such a filter. You can see that it is only showing Ads that are ‘Enabled’.